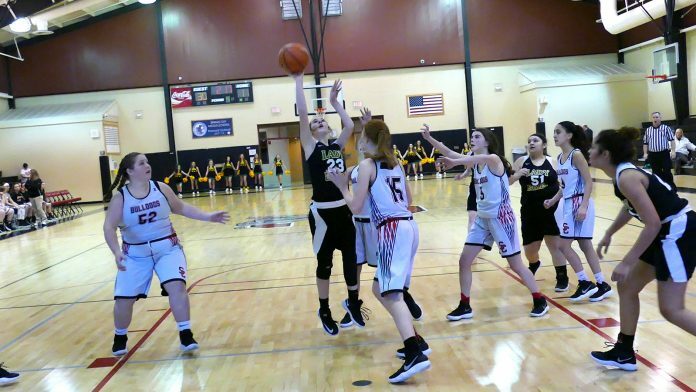 Spring City, TN — Rhea Middle School won 31-11 over Spring City in middle school ladies action on Monday afternoon at Spring City. Rhea Middle was looking for revenge for the win by the Lady Bulldogs earlier in the season at Rhea Middle by a 39-30 margin. Kylie Garrison had 13 points to lead the team in the win in that game. She was injured and not available for this game and Rhea Middle won 31-11. Sophie White lead the Lady Eagles with 13 points. Also scoring for Lady Eagles were: Skyler Jenkins 8, Sarah Conley 7, Michaela Reeves 2 and Lily Beth Johnston 1. Scoring for Spring City: Emily McClure and Karlee Thunquist 5 each and Ann Moses 1. Spring City stayed close as they trailed 13-7 at the half but a 13-3 third quarter pushed Lady Eagles out to large lead they never relinquished on way to 31-11 win. The Lady Eagles next play at Cleveland on Friday before playing in the SETAC tournament on Monday. The Lady Bulldogs will begin their post season tournament play on Saturday.